(012) Bug Fix (04/22/15/MIW): Exporting RW2D files to a raster format using RCL scripting now sizes vertically exaggerated diagrams correctly. (011) Bug Fix (04/22/15/JCJ): The LAS Import program correctly imports LAS files with wrapped lines (this bug was introduced in November of 2014). (010) Bug Fix (04/16/15/JCJ): The LAS Import program no longer fails if the project is configured to measure point data from the borehole collar. (009) Bug Fix (04/16/15/JPR): The Utilities / Map / Pie-Chart Map program now selectes the X and Y midpoint coordinates from the correct column. (008) Bug Fix (04/13/15/JPR): The object markers (the red dots that appear when clicking on a RockPlot2D object) for bitmaps within 2D striplogs are now properly registered with the image. 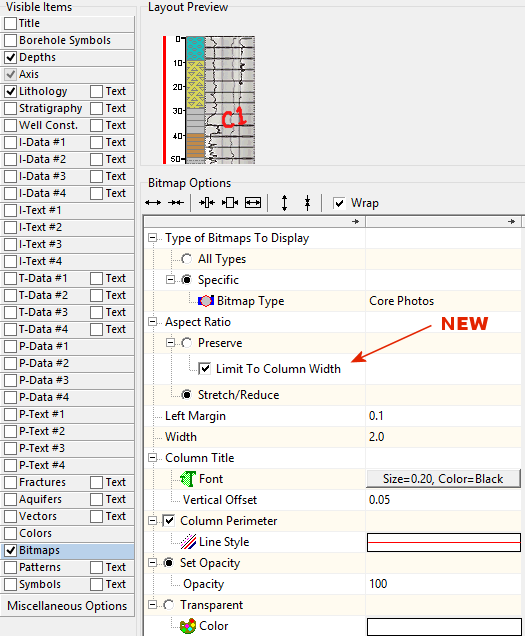 (007) New Feature (04/10/15/JPR): A new option titled "Limit To Column Width" has been added to the Bitmaps section of the 2D striplog design sub-menu. Aspect = Preserve / Limit To Column Width = True: Fill the designated vertical column (shown in red within the example below) while preserving the aspect ratio. Advantage: Images always extend to base of designated interval. Disadvantage: Images may laterally extend beyond the right-edge of the image column. Aspect = Preserve / Limit To Column Width = False: Adjust the images such that right edge of an image will never extend beyond the right edge of the image column. Advantage: Images never extend beyond right edge of image column. Disadvantage: Base of the images may not extend to the depth of the designated interval. Aspect = Stretch / Reduce: Independently stretch or reduce the horizontal and vertical dimensions of the bitmap to fit within the designated depth interval and column width: Advantage: Fills entire interval regardless of the original image aspect ratio. Disadvantage: May produce strange looking bitmaps. (006) Bug Fix (04/10/15/JCJ): The SQL-Server interface now delimits strings within 2D striplog queries with a single quote rather than a double-quote. Please note that this does not effect the Access/MDB version which accepts either format.